Love them or hate them, ‘games’ at weddings can be a great way to break the ice among your wedding guests and provide some great funny memories to look back on. Here are a few suggestions for wedding reception games to keep your guests entertained. Ask your guests to capture the moments even the best photographers miss. 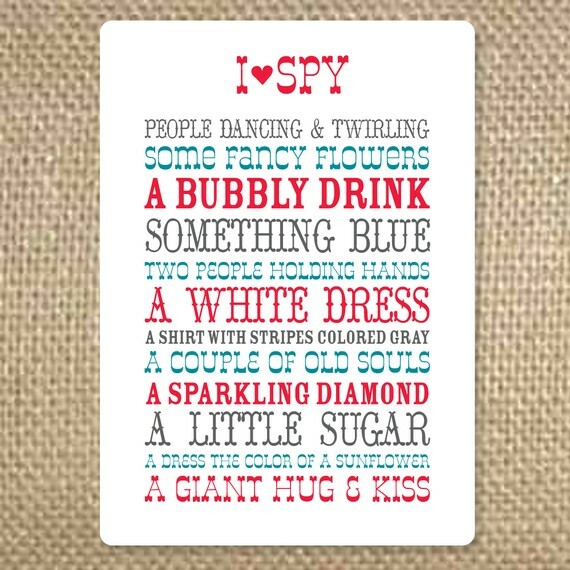 Place an ‘I Spy’ card on each table featuring a list of suggestions such as a giant hug or kiss, a bubbly drink or people dancing or twirling. Guests can use their digital cameras or smartphones and upload their images for you. You can tell them where to upload the photos on the card. Traditionally, people often use the old-fashioned glass-clinking during dinner to get the newlywed couple to show their affection by kissing. Turning it into this game adds an element of challenge. Alternatively, place cards in a fishbowl that contains tasks a guest can perform to get you to kiss, from easy to wacky. The guest can either choose to perform the task or take a seat and try again later. Once you have embarrassed your guests with the Kissing Game, it’s time for them to get their own back. This wedding game is really for the guests’ entertainment but can be extremely fun. You answer by holding up the corresponding shoe but neither of you can see which shoe the other is holding. Many times there is lots of laughter from your guests and you don’t know whether your spouse chose the same answer as you. Put a mini booklet and pens on each table. On the cover of the booklet ask a question for your guests to share their ideas. For example ‘What should we name our first child?’ or ‘How should we celebrate our first anniversary?’ A really simple wedding game that creates a lovely keepsake for the bride and groom. Replace floral centerpieces with a game at the center of each table. Encourage your guests to swap with other tables throughout the night for endless fun. Or, add a game station, where guests can grab a board game for their table. Everyone loves oversized Jenga. It is a great wedding game as it creates a bit of competitive excitement for your guests and is so easy to create the game yourself. Have you played any other games at weddings? Please let us know below.